Mary Walker rounds a barrel on Latte, the horse who fell on her causing catastrophic injuries in 2011, during the 2012 WNFR where Walker won her first world title. World champion barrel racer Mary Walker makes it sound like a milder dispute with the Almighty than it surely felt like. But the gentle way she speaks shouldn't disguise the hell she went through. "People reassure you and say, 'God's not going to put anything more on you than you can handle,'" Walker said. "But at that point in time, you seem to disagree a little bit." This is a series of stories about summer sports that may be under the radar. A lifelong horsewoman, she was married to a rodeo champion, and they had a 21-year-old son climbing the ranks of their sport. But in April 2011, Mary and Byron Walker lost their beloved boy in a car accident. And less than two months later, while still in the fog of that tragedy, Mary was seriously injured while competing on the horse she'd long been waiting for. Her arduous road to physical recovery had to run concurrently with an emotional journey of climbing back from what felt like bottomless grief. "I admit, I sat there in the hospital," Mary said, "and thought, 'God, what have I done to deserve all this?'" Byron, befitting his personality, is even more blunt. "We spent the most miserable eight months of my life together," he said. "A lot of it on the back patio, in record heat in Texas. She couldn't get out of her wheelchair for some of that time. I had to pick her up and move her. "How did we get through it? I don't know. I can't find the words for it. For us to live through that, though, we knew we could live through anything." But there was yet another phase to Mary's recovery: Getting back on her horse. And then one more step beyond that: Competing again. Fighting the fear. The memories. The uncertainty. But then, the triumph. Mary became a world champion barrel racer at age 53 in December 2012, and that alone would have made her an inspiration. But she did it after suffering her greatest loss, and then finding herself nearly immobile, her body wracked with pain. "I thought, 'I've still got Byron, and I have to take it day by day and just try to get myself back as a person,'" Mary said of the bleakest times in the summer and fall of 2011. "You just start working. Family, friends -- they keep you occupied and doing things. That's all you can do, is get through each day." The bond between barrel racer and horse is complete trust. In ideal human-equine pairings, there is unison of thought, intent and movement that almost borders on the supernatural. Mary, who is based in Ennis, Texas, began barrel racing as a youngster, and has continued through her adult life, joining the Women's Professional Rodeo Association in 1983. But she'd never had a horse the championship caliber of the one she got in 2011. Perculatin is his official name; he goes by "Latte." The bay gelding drew Mary's eye for about a year before she first rode him. 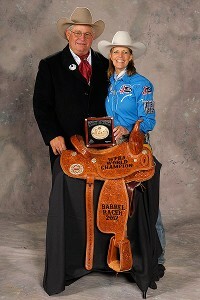 Byron and Mary Walker pose with Mary's world champion buckle and saddle, won at the 2012 Wrangler National Finals Rodeo in Las Vegas. "He was kind of a gritty horse; I could tell he enjoyed competing," Mary said. "I rode him for about six months in 2010, going into 2011." Mary and Byron didn't actually own Latte, though, until May 2011. That was the month after the accident that took their son. Handsome and charismatic, Reagon Walker had been a member of the Professional Rodeo Cowboys Association since shortly after his high school graduation in 2008. Reagon was a cowboy from birth. Dad Byron had been a world champion steer wrestler in 1981, and like Mary had competed in rodeo his whole life. A career in the sport had always seemed Reagon's destiny, too. He was traveling with his girlfriend Kaitlyn Larsen -- also a competitor -- to an event in April 2011. Kaitlyn survived the accident in north-central Texas; Reagon did not. "There's no cure for going through that," Byron said of his son's death. "It's the worst thing anybody can imagine. "I had been told this: That parents who lose a child a lot of times end up in divorce. And I was mindful of that. One of the reasons I got Latte for Mary was I hoped that it would give us something to keep us busy, to keep our minds on. And then Mary got hurt." In a June 2011 competition, going around the third barrel, Latte went down and fell on Mary. In the ambulance and in the hospital, all she kept asking was if Latte was OK. She was more worried about him than herself. "People kept assuring me he was all right and in the trailer heading home," Mary said. "I figured, we've got great doctors who can fix people, but with animals, there are injuries that can be career-ending." Latte was none the worse for wear, but Mary was. She had a shattered pelvis, multiple breaks in her hip, plus two broken vertebrae and two broken toes. But perhaps even more debilitating than those injuries was a severe flare-up of rheumatoid arthritis. "I was almost like a little shell; I couldn't move my hands, my arms, my neck," she said. "I got back on my medication [for RA] and finally was able to start doing little things again, like feeding and bathing myself. The arthritis actually probably hurt me physically more than the fall. "I was four months in a wheelchair, three months in physical therapy. I went from the wheelchair to a walker, then to a crutch, then to a cane." And then … back to a horse. "I wanted to ride again. Of course, they thought I was crazy," she said of her medical team. "I wanted to learn to get back on and off my horse, and to do the things around him every day that you normally just take for granted. "My goal was to get back where I'd left off. My doctor encouraged me; he said, 'We just have to get you going.' But at that time, he had no clue what I actually did; he knew nothing about rodeo. Then after seeing me compete for the first time he said, 'Well, I really wasn't talking about you doing that.'" Mary laughed at the surprise her physician and therapists expressed; they didn't know just how tough a competitor they were dealing with. "Did Mary tell you the story about throwing the bucket?" he asked. Despite a lifetime on horseback, Mary felt uncertain when first returning to where she'd always been comfortable. "She would feel off-balance and scared," Byron said. "Afraid she was going to fall off -- and afraid she was going to break if she did fall off. There would be crying sessions. But I'd get on her about it." It was the kind of tough love between fellow competitors -- who happened to be husband and wife -- that Mary needed. She rode a less-powerful horse as she re-acclimated herself to running barrels. Then, she returned to Latte. "He's the one that fell with me, but he didn't mean to do it," she said. "It was just an accident. I needed to get back on him and trust him. "I trust him with everything. He knows every move I'm going to make. He's my best friend. We spend every day together, and I know he trusts me, too." But the final bridge to cross? Mary had to trust herself. "She was giving away a ton of money hitting barrels last year," said Byron, of Mary costing herself in competitions. "I'd get mad about it." Byron had never been seriously injured as a competitor, so he wasn't really sure what it felt like to come back. Further, considering all they'd been through emotionally, he wasn't sure how hard to push. "I thought this horse could be good enough to just win us enough money to pay for gas so we could go have fun rodeoing," Byron said. "If I'm sitting here telling you I got that horse knowing all we'd be able to do -- B.S. I'd be lying. "But last summer, when [Mary and Latte] started running with the big dogs at some events, I thought, 'Well, we could be pretty good.'" Eventually, he became convinced she could be great. "He kept telling me over and over, 'You're going to win the [world championship]," Mary said. "And I kept thinking, 'If I just don't fall off this horse, I'm doing good.'" Then early last July, mild-mannered Mary finally lost her temper. "I'd been on her about hitting barrels," Byron said. "I'd show her the videos. I couldn't get her to admit we had a problem." One night after hitting a barrel, Mary -- in frustration -- harmlessly tossed a bucket across a parking lot. Byron turned to friend and said, "She won't hit another barrel." He felt sure Mary was over an emotional hurdle. "That week, she won about $12,000," Byron said. "The next week, $39,000. When she finally got mad, it was like, 'Enough is enough.' I haven't had to say a word since." 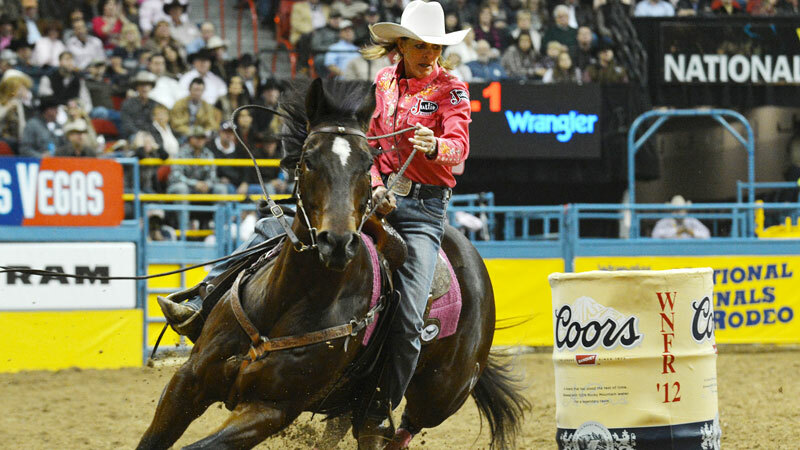 Mary headed to the Wrangler National Finals Rodeo in Las Vegas in December 2012 as the best story in the sport. But it was about to get even better. She had won 12 competitions and been co-champ of another in 2012. Now, on the biggest stage, she won four of the 10 rounds, and placed in four others. It earned her $146,941 at the NFR, for a yearly total of $274,233 to be world champion. She was 53, making her the second-oldest barrel racer to win a world title. Mary Burger did it at age 58 in 2006. "I couldn't believe I did it, especially after everything we'd been through," Mary said. "It was something I'd wanted my whole life, and at age 53, it came true." Still, Mary and Byron know that there will always be a void that can't be filled, a smile they will always miss. But Mary is also sure Reagon rides with her. Which is funny, considering he strongly disliked running barrels as a youngster. His mom insisted he do it before he settled into the events he excelled at. "There were things that happened all throughout last year," Mary said, "where I thought, 'There's got to be somebody here, helping me through this.' Just a feeling that Reagon was there. He was a great kid, a good-hearted person." Mary turned 54 in January and is still competing; she's currently second in the world standings. "We're going for it again," Mary said of the world title. "As long as I have Latte, we'll just keep on." Byron said he loves seeing how his wife inspires others, and the way she interacts with people at events. "It warms my heart when she's so sweet with the little kids," he said. "They come running out there wanting to get their picture taken with her. My job when she steps off the horse is to unsaddle him, and take care of this and that, so she can meet with her fans. And you know what? That's a good job to have." People constantly come up to Mary and tell her stories. Others e-mail or write. Like the man who sent a letter saying he lost his wife three days after she went into the hospital with a stomachache. He told Mary he watched on television as she won at the National Finals Rodeo, heard her story, and it made him smile for the first time since his wife had died. "If you can help one person … that's an amazing thing," Mary said. "Maybe that's the reason that this all happened."